There are three main ethno-territorial groups: Volga-Ural Tatars (including among others the Kazan Tatars, the Kasimov Tatars and the Mishars), Siberian Tatars (Tobol Tatars, Tara Tatars, Tyumen Tatars and more) and Astrakhan Tatars (Yurtovsk and Kundrovsk Tatars ). Religion: Mostly sunni-muslims, some Orthodox Christians. They live mostly in Tatarstan, Bashkortostan, Udmyrtiya, Mari-El, Mordovia, Chuvashiya, Volga-Ural region, West and East Siberia, Russian far east. The term "Tatar" has been used in a variety of ways since it appeared for the first time among Mongolian and Turkic tribes in the 6th to 9th c. For centuries it was used by Russians to describe anybody of Asian descent or anybody of Muslim or Turkic descent. More specifically, however, "Tatar" denominates the descendants of Kypchak and other Turkic tribes that migrated west out of Southern Siberia between the 10th and the 13th centuries. They formed an important part of the Mongol "Golden Horde" armies that invaded Russia in the 13th century. In the 13th and 14th centuries, by some complex ethnic process, the dominating group, the Kypchaks, assimilated the other Turkic-Mongolian tribes. 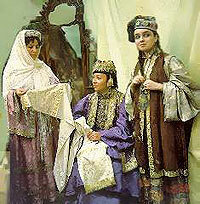 Some mixed with the indigenous groups in the area where they settled, while those who retained their Kypchak identity and converted to Islam, adopted the name "Tatar". When the "Golden Horde" disintegrated, new Tatar states like the Astrakhan Khanate and the Kazan Khanate emerged. Russia conquered these states in 1556 and 1552 respectively, and eventually, the Tatars spread east and west in the Russian empire and became divided into a variety of tribal and territorial groups. It was not until the fall of the Khanates that the name "Tatar" became common also to denominate the poorer parts of the population. Local self-denominations dominated, however, until the end of the 19th c., when there was a renaissance of Tatar nationalism. Between 1917 and 1919, many Tatar nationalists had camaigned for creation of a Volga-Urals state, which would have included the Tatars, Maris, Chuvash, and Bashkirs, but in 1920, the Bolsheviks established the smaller Tatar ASSR, as part of RSFSR. In the late 1980s, in the period of Perestroyka, Tatar nationalism again grew strong, and a variety of nationalist groups and movements appeared. In 1991, the most radical Tatar leaders called for a truly independent Tatar republic, including lands ever controlled historically by Tatars. Other groups advocated the creation af a greater Tataria to Unite the Tatar autonomous republic with other ethnically defined neighbouring regions (much like the dreams of the Tatar nationalists in 1917-19). In 1991, the Republic of Tatarstan replaced the former ASSR. As one of the Russian Federation's 89 subjects, it is struggling to increase its independence. In 1990, the Supreme Soviet of the Tatar ASSR adopted the "Declaration on the State Sovereignty of the Republic of Tatarstan". In February 1992, Tatarstan stopped sending tax revenues to Russia and in March the same year a referendum was held, in which 61% of the 2,132,000 participating voters approved the resolution for state sovereignty and absolute control of natural resources. Also in 1992, Tatarstan President, Mintimer Shaymiyev, refused to sign the new Union Treaty for the Russian Federation.